Carolyn Tuohy (PhD Yale), Professor Emeritus and Founding Fellow in Public Policy at the Munk School of Global Affairs and Public Policy, University of Toronto, gave a talk to our department about her most recent book, Remaking Policy: Scale, Pace, and Political Strategy in Health Care Reform (U of T Press, 2018) on Wednesday, March 13 2019 (photos below). Tuohy is a highly regarded scholar in comparative public policy, particularly social policy, in advanced industrial nations. She has authored numerous journal articles and book chapters on health and social policy including medical politics, professional self-regulation, regulation of occupational health hazards, and comparative approaches in public policy. Her books are detailed below. Tuohy held a number of senior roles at the University of Toronto from 1992-2005, including Deputy Provost and Vice-President, Government and Institutional Relations. The Carolyn Tuohy Impact on Public Policy Award was created on the occasion of Tuohy’s departure from her role as Vice-President, Government and Institutional Relations. 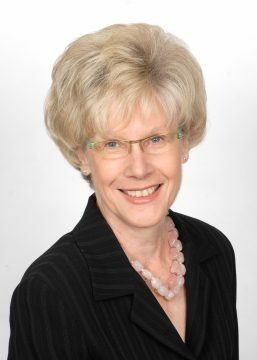 Tuohy is frequently consulted by government and related agencies on public policy matters, and she is a Fellow of the Royal Society of Canada. One of the most persistent puzzles in comparative public policy concerns the conditions under which discontinuous policy change occurs. In Remaking Policy, Carolyn Hughes Tuohy advances an ambitious new approach to understanding the relationship between political context and policy change. 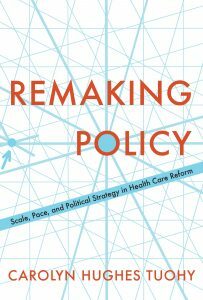 Focusing on health care policy, Tuohy argues for a more nuanced conception of the dynamics of policy change, one that makes two key distinctions regarding the opportunities for change and the magnitude of such changes. Four possible strategies emerge: large-scale and fast-paced (“big bang”), large-scale and slow-paced (“blueprint”), small-scale and rapid (“mosaic”), and small-scale and gradual (“incremental”). As Tuohy demonstrates, these strategies are determined not by political and institutional conditions themselves, but by the ways in which political actors, individually and collectively, read those conditions to assess their prospects for success in the present and over time. Drawing on interviews as well as primary and secondary accounts of ten health policy cases over seven decades (1945—2015) in the US, UK, the Netherlands, and Canada, Remaking Policy represents a major advance in understanding the scale and pace of change in health policy and beyond. What drives change in health care systems? Why do certain changes occur in some nations and not in others? 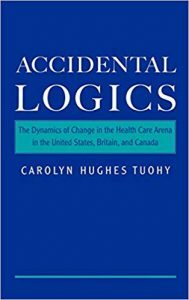 Author Carolyn Hughes Tuohy argues that the answer lies in understanding the “accidents” of history that have shaped national systems at critical moments, and in the distinctive “logics” of these systems. Tuohy looks at the experiences of Britain, Canada, and the US, offering an international comparative study of public policy systems, as well as a recent history of the circumstances in each country that have impacted on the structures of each’s national health care system. The guiding focus of the book is Tuohy’s study of decision making systems in each country, looking at the decisions made by those who provide, finance, and use health care services. Finally, Tuohy reviews current issues in the health care arenas of these three nations and provides suggestions to guide the strategic judgments that decision-makers must make. At a time when Canadian political institutions are being fundamentally questioned, this book provides a comparative perspective on the distinctive features of the Canadian policy process hich have enabled conflict to be resolved in the past. In comparison with other Western industrial nations, Canada’s policies in some arenas appear as models of workable compromise; in others, they stand out as marked by continuing irresolution. 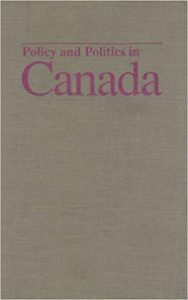 In this first book-length treatment of Canadian public policy in comparative perspective, Carolyn Tuohy focuses on constitutional change, health care delivery, industrial relations and labor market policy, economic development and adjustment, oil and gas policy, and minority language rights. What distinguishes Canada’s characteristic policy process is its quintessential ambivalence: ambivalence about the appropriate role of the state, about definitions of political community, and about individual and collective values and conceptions of rights. Embedded in the country’s political institutions, it has deep roots in Canada’s relationship to the United States, its history of English-French tensions, and its regional diversity. Examining in particular the delicate federal-provincial division of power and the legislative-judicial relationship, Tuohy discusses how the constitutional debates of the 1980s and 1990s are testing Canada’s institutions to resolve conflict. 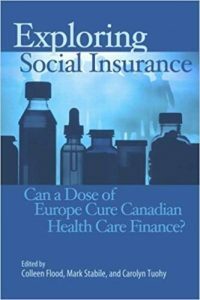 Tuohy is the co-editor of Exploring Social Insurance: Can a Dose of Europe Cure Canadian Health Care Finance? (Montreal: McGill-Queen’s University Press, 2008). Sustainability, quality, and accessibility are vital questions in Canadian health care. All Canadian governments, concerned about the growing share of the public budget absorbed by health care, are questioning the sustainability of the present system. How can we maintain and improve access to health care services of appropriate quality while ensuring sustainability? If there is one consolation to Canadian governments as they wrestle with the future of Medicare, it is that sustainability concerns are not unique to Canada but affect all countries, regardless of the level of private financing in a system. Some countries, however – particularly social insurance countries in Northern Europe such as Germany and France – manage to achieve universal access without wrestling with waiting lists, while providing a wide range of services. This book examines whether the grail of sustainability, quality, and accessibility could be better achieved through a marriage of the traditional Canadian model with elements of a European system. Contributors include Sherry Glied (Columbia), Stefan Gress (Duisburg-Essen), Morley Gunderson and Doug Hyatt (Toronto), Tim Jost (Washington and Lee Universities), Ted Marmor (Yale), Jack Mintz (Toronto), Steve Morgan (UBC), Terry Sullivan (Cancer Care Ontario), Joe White (Case Western Reserve University), and Wynand Van de Ven (Erasmus).